Revolutions are incisive and transformative events in societies. Events, in turn, are constructions. Distinct dates and specific periods, selected from a stream of occurrences, emerge as events that – in the case of revolutions – have stimulated significant change in societies. Change in respect of revolutions implies the (violent) dissolution of structures and institutions, questioning of the legitimacy of power and its narratives, and thus the altering of established perceptions of meaning. Sven Trakulhun analyses these constructions of revolutions in different early modern European media (p. 17). He analyses numerous reflections of Asian revolutionary events in 17th century European stage plays, in travelogues and reports of the 18th and 19th centuries as well as in historiographical writings, including translations since the 16th century. The structure of the analyses follows Trakulhun’s theoretical contextualisation of the selected reflections: a circular understanding of history in contemporary 16th and 17th centuries’ salvation history; an enlightened (conservative) rational interpretation of historical development since the end of the 17th century, and the emergence of a linear and future-oriented understanding of revolution after the French Revolution. According to Trakulhun, these three universal models of historical thinking inform the interpretations of events as “revolution” in early modern Europe (p. 18). The interpretation of events as revolutionary seems to have been, according to the author, a popular trend in the 17th century (p. 53, 108). In this context, the analysis in the first part of the book starts with reflections on (imperial) decay and war as a revolutionary event. The most prominent case was the fall of the Ming and the rise of the Qing, which had been in the centre of Martino Martini’s “De bello Tartarico”. The mechanisms of dynastic change and sacred legitimacy of rule nurtured, furthermore, the European drama. Trakulhun’s analysis of plays by Joost van den Vondel, Antonides van der Goes and Elkanah Settle emphasizes on the one hand the universal principles of divine stability in connection with historical circles of rise and fall. On the other hand, these plays create a “Chinese Revolution” through the application of revolutionary characteristics and experiences in Europe, particularly a high level of violence and destruction (p. 93) as well as the experiences in the context of the “Glorious Revolution” in England (p. 98). The second part of the book starts with a reflection of (cultural) differences in the course of revolutionary events and thus introduces a more empirical and secular approach in the perception of “revolutions” and “revolutionary events” at the end of the 17th and the 18th centuries. The starting point is a partly lengthy discussion of well-known discourses about Oriental despotism, tyranny and Asian stagnation. “Revolution” appears in these discourses as usually bloody dynastic succession conflicts in Siam and India, which expands the semantic of the revolutionary concept towards fratricide and patricide (p. 129). Was that revolutionary? François Bernier and François- Henri Turpin thought apparently it was. Nadir Shah and Persia serve as another despotic example. However, the writings of Dennis De Coetlogon, John Chardin or Muhammad Kazim Marvi suggest a strong legal perception of “usurpation” and its rightfulness in the context of imperial succession as a revolutionary event. Nothing new so far. More interesting are the reflections on the rightfulness of the British way of colonial rule in Bengal after 1757. The revolutionary event refers here to the haphazardly establishment of order, which was harshly criticized preferably by aggrieved returnees, who had been defeated in the manifold power struggles within administration of the new colonies (p. 167, 169). The so-called “Bengal revolutions” initiated the localization of order and the re-emergence of traditional legal patterns, introducing, according to William Robertson, ancient Indian state order (p. 177). That this was a revolutionary event became clear only in the moment when British officials and intellectuals realized that the codification and thus inflexible application of ancient Indian law was a very new approach towards traditionally flexible patterns of jurisdiction in the polities of the subcontinent (p. 179). However, the impact of British interventions in Indian law and customs are not new. The third part of the book reflects “revolution”-narratives in mainly German, British and French historiography of the 18th and 19th centuries. The experiences of the colonial encounters since the Portuguese on the one hand and the new enlightened models to explain the world widened the European perspective for more universal and first global historiographies, which had already inspired Geoffrey C. Gunn to conceptualize his “First Globalization” in 2003. While Gunn refers, besides several travel accounts and reports, to the revolution of geography and its importance for historiography, Trakulhun addresses a strident academic discourse about history and historiography which starts with August Ludwig Schlözer and his “Universal-Historie” (p. 275). It is a debate about the aim and direction of history and history writing, the ethnologic and anthropologic methods and theories and their application in historical research as well as an early debate about the distinction of races (p. 298). Revolutions appear as influential turning points and key events in the narratives about the peoples of the world, but particularly Scottish and British contributions tend to distinguish “evolution” from “revolution” (p. 283). The harshness of French revolutionaries encountered much opposition in the German academic circles. However, the idea of progress became a very important characteristic of historiographic works as much as of the concept of revolution (p. 304). 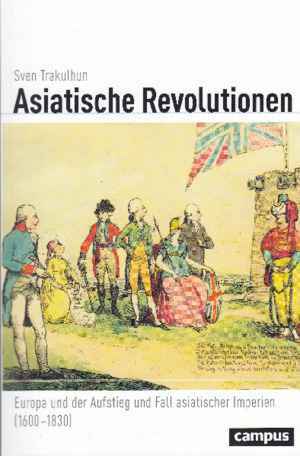 Trakulhun gives a solid account of German, French and British writings about the “Asian Revolutions” in the early modern period. Lengthy summaries about (often well-known) people, events, histories and numerous deviations from the research question make this a very German book and one wishes from time to time to be taken along on the excursions the author makes. Trakulhun also stresses the importance of different media beyond text and the numerous mediations of well-documented revolutions. As much as this corresponds with current trends to incorporate the material culture as an important historical source and media, the most recent theories on mediation and re-mediation and similar theories are missing. Peter C. Perdue, Chinas Marches West: The Qing Conquest of Central Eurasia, Cambridge, Mass. 2005, p. 6. Merle C. Ricklefs/ Bruce Lockhart/ Albert Lau / Portia Reyes/ Maitrii Aung-Thwin, A New History of Southeast Asia, Basingstoke 2010, pp. 137-142. Geoffrey C. Gunn, First Globalization: The Eurasian Exchange, 1500-1800, p. 33f. Astrid Erll, Pre-mediation – Remediation: Repräsentationen des indischen Aufstands in imperialen und postkolonialen Medienkulturen (von 1857 bis zur Gegenwart), Trier 2007. Alexander Drost: Rezension zu: Trakulhun, Sven: Asiatische Revolutionen. Europa und der Aufstieg und Fall asiatischer Imperien (1600-1830). Frankfurt Main 2017 , in: Connections. A Journal for Historians and Area Specialists, 08.03.2019, <www.connections.clio-online.net/publicationreview/id/rezbuecher-29982>.